Aubrey went to Hot Springs this weekend to visit her friend Kali. Instead of sitting alone in an Arkadelphia pew this morning, I made the drive to meet them at her Hot Springs church. 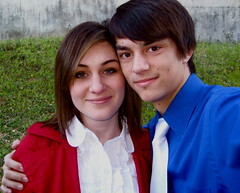 I wore blue and Aubrey wore red. We both wore white. All accidentally. It made for nice photos! The service was excellent. It excited me to see a body of believers so open amongst themselves. There was no sense of "acting the part" in this church, everyone was open. I loved being apart of it, even if just for one service. Afterwards, Aubrey and I joined her friend's family at the Hot Springs Country Club. The one place that I really have no business, and feel the most uncomfortable. I managed to about knock over two elderly ladies, as well as move my knife quickly to a more appropriate stationary location: the floor. In front of everybody! It was an embarrassing affair, to say the least, which is a big deal for me. I try to remain comfortable in all scenarios. This weekend was a blast in general, I cant wait to get the rest of the details posted soon.